Mr. Takeshi Kanda (first generation), who was born in Hiroshima Prefecture and graduated from the Faculty of Agriculture at Tottori University, accepted a post at the Agricultural Research Station in Nara Prefecture. 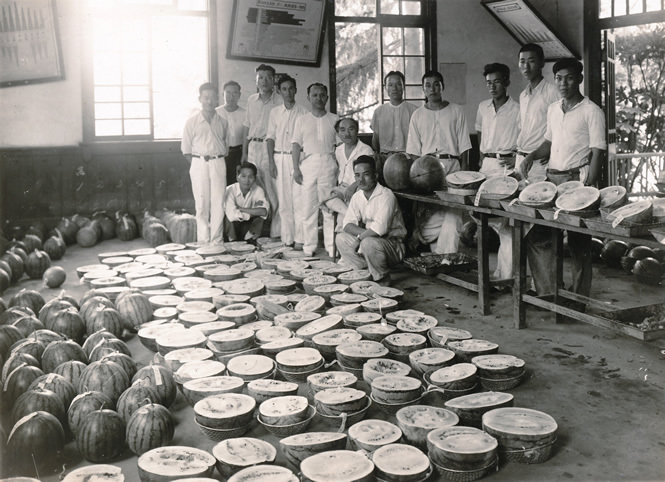 Under the supervision of Yoshinori Takezaki, Ph.D., Mr. Kanda worked on the breed improvement of watermelons. He made noteworthy contributions to the development of various new types of watermelons that became the first F1 hybrids in Japan (e.g. “Shin Yamato,” “Ki Yamato,” “Asahi Yamato” and “Yamato Cream”) as well as to the establishment of technical guidance for the cultivation and popularization of breeds, and to the advancement of research in botanical genetics. Mr. Hirashi Fujii, a well published former engineer at the Research Institute of Environment, Agriculture and Fisheries in Osaka Prefecture, described Takeshi Kanda in his 1980 work Saibaigaku Hihan Josetsu (A Critical Introduction to Agronomics), published by Rural Culture Association Japan, with the following words: “He was treated like a walking god of watermelon farmers and was even called ‘The Watermelon Kanda’ ” (p.172). After being discharged from military service in New Britain, Indonesia in 1946, Takeshi Kanda worked for the Nagaoka Research Farm of Takii & Co., Ltd. While continuing his breeding research, he taught at a specialized vocational school for horticulture that was affiliated with the Takii Research Farm. He became a close associate of Woo Jang Chun, the former head of the Research Farm who had achieved world-class success in the breeding of brassica family plants. 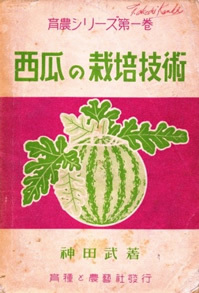 In 1949, Mr. Kanda released the book Suika no Saibai Gijutsu (Watermelon Cultivation Techniques), published by Ikushu-to-nougeisha. After retiring from Takii & Co., Ltd.., Takeshi Kanda opened the Kanda Seed Store in Minamiyagi-cho, Kashihara City, Nara Prefecture, as a retail and wholesale outlet for seeds, seedlings, etc.. He also owned a research farm and engaged in the breeding and cultivation of various vegetables, including watermelons, cucumbers, and melons. The legal incorporation of Kanda Seed Co., Ltd.
Mr. Takeshi Kanda (second generation) became President of the company. During his years in office, he served two terms as Chairman of the Technical Research Department of the Japan Seed Trade Association. After that, he served as Head of the Nara Branch of the same association. The building of new company premises was completed in Shinga-cho, Kashihara City, Nara Prefecture. Founder and Chairman Takeshi Kanda passed away. Takeshi Kanda (second generation) passed away. Minoru Kanda assumed the post of CEO. Minoru Kanda served as Head of the Nara Branch of the Japan Seed Trade Association. A new warehouse was completed. Minoru Kanda became an auditor of the Japan Seed Trade Association. Since the foundation of our company, the breeds that we have developed have garnered numerous awards, including the Minister of Agriculture, Forestry and Fisheries Award of the “All Japan Vegetable Breed Screening Committee”. Copyright © KANDA SEED CO., LTD. All rights reserved.